Millionaire's Shortbread is a timeless classic British treat. It combines a layer of shortbread with a thick layer of caramel and topped with a rich chocolate. This version then takes it to the next level! Top it with Cadbury's Mini Créme Eggs to make the ultimate indulgent Easter tray bake. 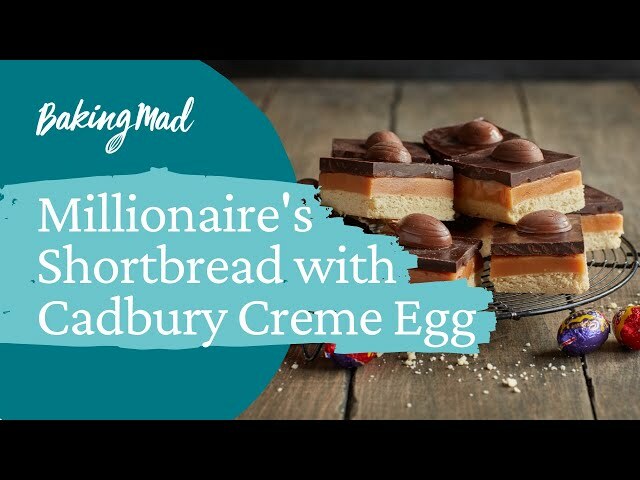 Millionaire's Shortbread with Cadbury's Mini Créme Eggs- you can use bigger eggs if you want. Heat the oven to 160'c (fan 140'c, gas mark 3). Line a 20cm x 23cm tin with baking paper, making sure the paper overhangs slightly so it's easier to remove the finished cake. For the shortbread layer, place the sugar, butter and flours into a food processor. Whizz until a soft dough is made. Spoon the dough into the prepared tin and lightly press to form a smooth base. Bubble and stir the mixture gently for 5 to 8 minutes, until you get a thick and fudge-like mix. Pour over the cold shortbread in an even layer. Leave to cool. Once the caramel has cooled, chop the chocolate and place in a bowl suspended over a pan of simmering water. Do not let the water touch the bottom of the pan as this can cause the chocolate to burn. Stir the chocolate until melted. Once it has totally melted, pour it over the cooled caramel and then place Cadbury's Creme Eggs into the chocolate. You can use as many as you like! Allow it to set at room temperature. When it's ready to serve, remove it from the tin using the paper to help. Cut it into little squares (or big ones if you're feeling naughty).